One of the gastronomic advantages of living in the Los Angeles metropolis is the vast availability of ethnic restaurants and foods from all over the world. You often don’t need to drive more than 30 minutes to find authentic restaurants that will transport your taste buds to another part of the globe. I love spicy food and Korean cuisine is one of my favorite. I’ve been fortunate to enjoy it in the city of Seoul in Korea during my airline pilot days in the 1980’s. It was a bitterly cold winter day when my crew and I had a layover and I have vivid memories of enjoying a hot pot of spicy tofu with bits of pork and green onion in a cozy restaurant while the chilly wind howled outside. I’ve been told by my Korean friends who have settled in the US that Korean food in Los Angeles has evolved into its own variant. LA-fied Korean cuisine has even become its own bona fide style that has been “exported” back to the homeland. 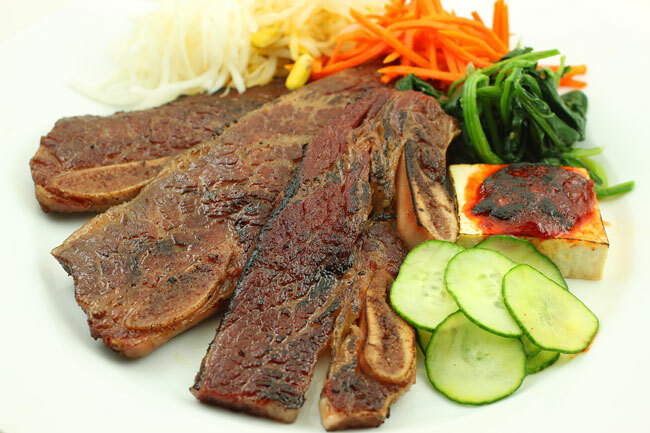 For example, the classic Galbi (or Kalbi) beef prepared in Los Angles uses the flanken (cross-sectional) cut of the beef short rib while the whole meaty rib-on-the-bone version is more popular in Korea. 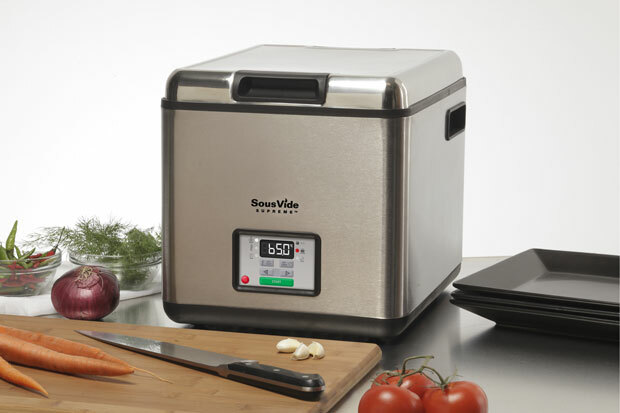 Thanks to the gracious folks at SousVideSupreme.com, I’ve been able to get my feet wet (pun intended) in a new realm of low-and-slow cooking with the 3-gallon sous vide water immersion oven they produce for the home cook. Sous vide or hot water bath cooking has been around for a while and it’s common among high-end restaurants and commercial food processing facilities. Since 2009, its popularity has been growing as more and more home cooks have discovered its advantages for cooking tough cuts of meat and its season, seal, and simmer convenience. After cooking, you can refrigerate or freeze your entrée, and then reheat without any loss of flavor or texture. For a brief primer on how I got my loaner, please see this article. As an avid home cook, I love trying new devices and techniques on my favorite foods. When SousVideSupreme.com asked food bloggers to submit their favorite recipe, I sent in my Beef Rendang recipe and won the People Choice award and a nice prize for my entry. 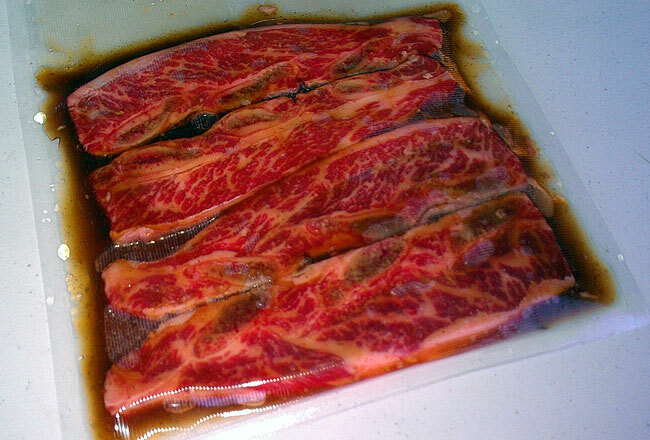 In this article, I’ll share my Sous Vide version of the classic Korean short ribs with you. There are two secret ingredients in the marinade that my Korean friends told me that make this dish especially tender and flavorful: Asian pear and 7Up soda! Apparently the Asian pear provides some tenderizing effect and the carbonation and sugar of the 7Up sweetens the dish. I’ve been told that this version was introduced in America as the homeland version does not use it. Puree marinade ingredients in a blender. Always a beautiful mouthwatering presentation! My wife is from Korea and makes these ribs. And she does use 7-Up and Asian pear in the marinade. I will say I am not sure why you would Sous Vide these. After they marinade and you give them a hot and fast sear, they are tender enough without the three day bath. Yes, it was for a cooking contest sponsored by the SVS company. A hot sear works very well with this style of ribs. Big fan here. This recipe is very similar to what Koreans call "Kalbi Jjim". 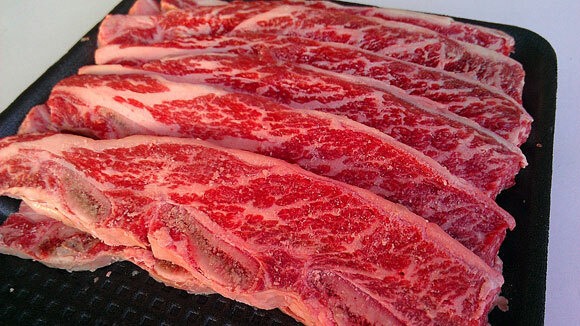 The cut of rib meat is thicker and more cube-shaped. 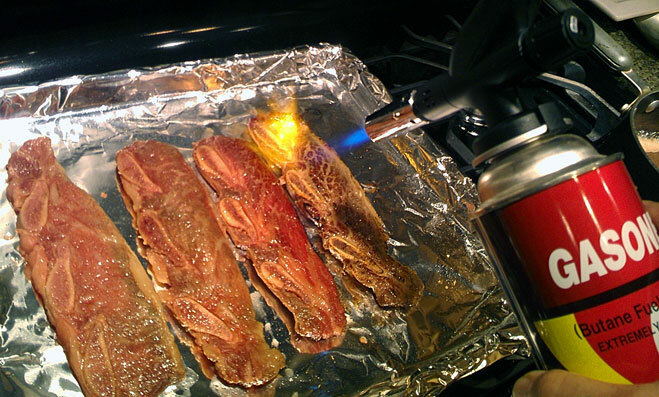 Months ago I tried to smoke kalbi but ended up with jerky-like strips of meat. It was still tasty but very dry and rubbery. I’ll try it out again, but maybe I can smoke the meat then slow cook after or vice versa? What do you think? Thanks! Yes, nuerous cultures use onion water as the base for a marinade. The Persians use it as a base for shish kebab. The Korean "Calbi" or "Kalbi" has onion slush mixed with Asian Pear slush and sometimes Kiwi fruit. Pineapple and papaya is also used in others. So that you don’t get it dry like jerky, cook it lower at 250F first. Temp the meat and once it gets to about 100F or so, move it over to the hot zone to char. I like my Kalbi cooked med-rare. I know I’m late to the party, but after the 3 day bath what is the doneness of the ribs? Is it med rare, fall off the bone or somewhere in between? In your ingredients list, you have "1 tsp SYD Hot Rub or salt and pepper". When I click on the SYD Hot Rub link, it takes me to a full website (Big Poppa Smokers) offering lots of interesting seasoning/rub options. Is there a specific one you are recommending? The only "SYD" brand–your brand I am assuming–lists 2 sizes of Chicken Rub. Sorry, bad link. Thanks for finding it so we can fix. Meanwhile please go to my Store page and order the All Purpose rub used for my Korean short rib recipe. Did 99ranch rip off your image of the raw short ribs in their ad?